There is a more recent version of this report. See the most recent version. Note: We did not look for new literature on insecticide resistance in 2014 and only did a cursory review of new literature in 2015 (for more information, see here). This page lays out what we know regarding key questions around ITN resistance (defined broadly as "any ways in which populations of mosquitoes adapt to the presence of ITNs in order to make them less effective"). We then give some general considerations in favor of not weighing this factor too heavily against ITN distribution for the time being. Throughout this writeup, we primarily rely on two review papers (one by the World Health Organization) whose claims we have not vetted (by, for example, examining the studies they cite); for the most part the claims cited here are fairly straightforward and we have relatively little cause for skepticism about them. What is known about the current state of resistance? Is the level of resistance increasing? Is this caused by the use of ITNs? What is the impact of resistance on ITN distribution and other control measures? What can aid actors do about this issue? In this section we primarily cite the World Health Organization's Global Plan for Insecticide Resistance Management in Malaria Vectors (though its content is consistent with that of the other source we've relied on most for this report, Ranson 2011). "Resistance" can be used to refer to genetic properties of mosquitoes, to refer to behavioral properties of mosquitoes, or to refer directly to failures of mosquito control.1 In the context of malaria control, we've generally seen it used to refer to the first two; as discussed below, there is relatively little evidence of control failure due to these factors, so "resistance" is usually used to discuss specific risk factors for control failure. Target-site resistance (of which "knock-down resistance" is the main type we've seen discussed): mosquitoes may develop mutations that make insecticides less effective in disabling them after reaching their "target site" (the part of the mosquito that the insecticide seeks to directly affect, often with the nervous system). Metabolic resistance: mosquitoes possess internal systems to detoxify foreign materials; these systems may evolve to more effectively detoxify insecticides. Cuticular resistance: mosquitoes' exteriors may become less prone to absorbing insecticide. Behavioral resistance: mosquitoes may change their behavior to avoid control efforts - for example, being more active at the times of day when humans are less likely to be indoors and protected by insecticides. The report mentions that "All behavioural traits, however, may not be negative, as they could lead mosquitoes to feed on non-human animals. It is also possible to initially mistake the decline of a vector species as behavioural resistance." Behavioural and cuticular resistance mechanisms are rarer than the other mechanisms and are perceived by most experts to be a lesser threat than chemical resistance. They are therefore not further discussed in this document. Some experts, however, consider behavioural resistance to be of considerable importance, and further research should be conducted to understand its significance. Resistance appears common (though far from universal) in the area of western African running from Cote d'Ivoire through Cameroon; it is less common in the countries west of that and in southeast Africa; data from other parts of Africa is thin or nonexistent. The above covers only target-site and metabolic resistance, which make insecticides less effective in killing mosquitoes; by the nature of the laboratory test, it does not address behavioral resistance. As discussed above, there is currently relatively little evidence regarding behavioral resistance and no clear consensus about its importance. There is relatively little data available to assess this issue. It isn't standard to collect data on malaria cases as part of an ITN distribution, and it seems that cases in which one can pinpoint the timing of both an ITN distribution and subsequent trends in malaria cases are relatively rare. We'll be writing more about this general issue in the future; our impression is that what data there is implies that malaria has been in decline and (less strongly) that ITNs have been effective, in general, but the case is far from comprehensive. Our impression is that resistance was also a factor in earlier malaria control efforts, but may not have been as rigorously studied; the sources we've reviewed do not refer to these earlier efforts. We're very concerned about insecticide resistance. It appears that relatively little is known about the extent, causes, and control implications of resistance; that resistance could substantially effect (or even negate) the effectiveness of malaria control; and that more research has great potential to improve the impact of the substantial amounts of money spent on LLIN distribution (and other forms of mosquito control). This investigation has highlighted research on insecticide resistance as a potentially outstanding giving opportunity itself, and we hope to look into it more. That said, this issue doesn't change our bottom line that LLIN distribution is a highly cost-effective intervention or that Against Malaria Foundation is our #1-rated charity. There is strong evidence that LLINs reduce malaria and save lives and only preliminary/suggestive/mixed evidence that insecticide resistance may reduce their impact. Importantly, it appears to us that the malaria control community has been devoting at least some attention and investigation to this issue for a long time, has developed a reasonable knowledge base (if one that has plenty of room to grow), and still recommends the use of LLINs regardless of the resistance situation (as noted in the previous section). We have previously been impressed with the thoughtfulness and data behind malaria scholars' answers to our concerns over the interpretation of macro-level data on LLIN distributions and malaria burden, the question of why universal coverage is now being pursued (as opposed to targeting children under five), the question of whether ITNs delay the development of immunity and thus merely delay malaria deaths, and the question of whether ITNs are used by recipients, and are inclined to put high weight on recommendations such as this. We see it as very important to monitor and report changes in the malaria burden following ITN distributions, as Against Malaria Foundation is attempting to do. This isn't a substitute for studying resistance specifically, which may help the malaria control community anticipate problems before they arise. But it seems important as a way to know when resistance - or something else - has become a big enough problem to interfere with the effectiveness of ITNs in the field. We think the fact that we're discussing this issue at all speaks to the extraordinarily and unusually strong evidence base (and supply of data) behind ITN distribution. For most aid interventions that donors can fund - water infrastructure, agriculture interventions, etc. - the set of "things that could go wrong" is large and broad, and we have little evidence to address most of them. By contrast, when looking at LLIN distribution, we see strong basic evidence for impact and reasonably good (if not conclusive) answers to the most obvious concerns about how real-world effectiveness compares to the efficacy seen in studies. The remaining concerns are few and specific enough that the malaria control community is able to put substantial resources into specifically investigating them. We scanned the publications lists of the Roll Back Malaria Partnership, President's Malaria Initiative, the Alliance for Malaria Prevention, the Malaria Consortium and the World Health Organization page on malaria, looking for recent publications that appeared to be comprehensive reviews (as opposed to single studies) on insecticide resistance. We found Ranson 2011 and World Health Organization 2012 this way. We searched the Malaria Journal for "resistant" and "resistance," scanned for publications relevant to insecticide resistance as it relates to LLINs, and sampled these publications (particularly their introductions which discuss previous literature). What we saw was generally consistent with what we had read in Ranson 2011 and World Health Organization 2012. We corresponded over email with Dr. Abdisalan Noor, a member of Against Malaria Foundation's Malaria Advisory Group, who pointed us to Ranson 2011. We also spoke with Dr. Steve Lindsay (another member of Against Malaria Foundation's Malaria Advisory Group), who pointed us to both Ranson 2011 and World Health Organization 2012. Notes from the latter conversation are forthcoming. "Molecular genotyping of resistance is the identification of the underlying genes that confer the inherited trait of resistance (15 ). Identification of a resistance gene provides evidence of the underlying evolutionary process. Depending on the type of resistance mechanism, this provides understanding of both the degree of resistance expressed in individual insects with the resistance gene, and the frequency of such insects in the population. "Phenotypic resistance is the basic expression of the genetic cause of resistance, shown by a vector’s ability to resist and survive the effects of the insecticide. Phenotypic resistance is measured in a susceptibility test of vector mortality when subjected to a standard dose of the insecticide. WHO has defined phenotypic resistance as “development of an ability, in a strain of insects, to tolerate doses of toxicants, which would prove lethal to the majority of individuals in a normal population of the same species” (16 ). Phenotypic resistance is the phenomenon most commonly referred to in public health. "Resistance leading to control failure - while phenotypic resistance provides an indication of the effects of resistance on the vector, the most informative way of looking at resistance is as an epidemiological phenomenon, in which resistance is identified as the cause of increasing malaria transmission. In the notion of resistance leading to control failure, evidence of resistant vectors is linked directly to the failure of vector control programmes in the field. Resistance leading to control failure can be defined as the 'selection of heritable characteristics in insect population that results in repeated failure of an insecticide product to provide intended level of control when used as recommended.' Resistance leading to control failure is the phenomenon mocommonly referred to in agriculture. National malaria control programmes should not, however, wait for control failure to occur before implementing strategies to manage insecticide resistance. There is no acceptable level of control failure in public health, and waiting could result in delaying action until it is too late." World Health Organization 2012, Pg 27. "Target-site resistance occurs when the site of action of an insecticide (typically within the nervous system) is modified in resistant strains, such that the insecticide no longer binds effectively and the insect is therefore unaffected, or less affected, by the insecticide. Resistance mutations, known as knock-down resistance (kdr ) mutations, can affect acetylcholinesterase, which is the molecular target of organophosphates and carbamates, or voltage-gated sodium channels (for pyrethroids and DDT) ( 15 , 17 ). "Metabolic resistance is related to the enzyme systems that all insects possess to detoxify foreign materials. It occurs when increased or modified activities of an enzyme system prevent the insecticide from reaching its intended site of action. The three main enzyme systems are: esterases, mono-oxygenases and glutathione S-transferases. While metabolic resistance is important for all four insecticide classes, different enzymes affect different classes ( 15 , 17 ). "Although most resistance mechanisms (especially kdr resistance) have been studied for decades in previous cases of resistance, the detailed study of mono-oxygenase metabolic resistance is relatively new, and our understanding of it is fairly limited. Indeed, cases of mono-oxygenase resistance in mosquitoes were unknown before its identification in South Africa in 2000–2001 (see section 1.2.3 for details). "As described below, metabolic and target site resistance can both occur in the same vector population and sometimes within the same individual mosquito. The two types of resistance appear to have different capacities to reduce the effectiveness of insecticide-based vector control interventions, with metabolic resistance being the stronger and more worrying mechanism (see section 1.2.3 for details). "Behavioural resistance is any modification in insect behaviour that helps it to avoid the lethal effects of insecticides. Several publications have suggested the existence of behavioural resistance and described changes in vectors’ feeding or resting behaviour to minimize contact with insecticides. Studies in New Guinea and the Solomon Islands showed that Anopheles farauti vectors stopped biting later in the night (23:00–03:00) after the introduction of indoor DDT spraying and instead bit only in the earlier part of the evening, before humans were protected by sleeping in a sprayed room ( 18 ). In most cases, however, there are insufficient data to assess whether behavioural avoidance traits are genetic or adaptive; genetic traits could have major implications for the types of vector control interventions needed. All behavioural traits, however, may not be negative, as they could lead mosquitoes to feed on non-human animals. It is also possible to initially mistake the decline of a vector species as behavioural resistance. "Cuticular resistance is reduced uptake of insecticide due to modifications in the insect cuticle that prevent or slow the absorption or penetration of insecticides. Examples of reduced penetration mechanisms are extremely limited and only one study has suggested correlation between cuticle thickness and pyrethroid resistance in An. funestus (19). Microarray experiments have identified two genes that encode cuticular proteins that are up-regulated in pyrethroid-resistant strains of Anopheles mosquitoes. Experience with other insects suggests that if cuticular resistance emerges in mosquitoes it could have a significant impact when combined with other resistance mechanisms." World Health Organization 2012, Pg 27-28. "To build these maps, an Insecticide Resistance (IR) database was generated using data colleted from 2000-2010. Sites were located using publications and the Geonames database of the National Geospatial-Intelligence Agency, and spatialized using the ESRI ArcGis Software. Resistance was defined according to standard WHO definitions, as described by WHO ." Ranson 2011, Pg 18. WHO  refers to the source we cite as World Health Organization 1998. Where <95% mortality occurs in tests that have been conducted under optimum conditions with a sample size of >100 mosquitoes then resistance can be strongly suspected." World Health Organization 1998, Pg 17. "Where knock down resistance (kdr) is involved, KD rate [knock down rate] is a sensitive indicator for early detection of pyrethroid resistance." World Health Organization 1998, Pg 16. "Typically two major mechanisms are assumed to be responsible for insecticide resistance: changes in the target site that reduce the binding of insecticides, and increases in the rate of insecticide metabolism that lower the amount of insecticide reaching the target site. Both of these resistance mechanisms are known to contribute to pyrethroid resistance in malaria vectors and are subjects of extensive research to determine their distribution and impact, and to develop improved methods of detection. Of these, target site resistance is best understood and molecular diagnostics to detect this resistance mechanism are now integrated into insecticide resistance monitoring strategies in some malaria control programmes." Ranson 2011, Pg 2. "The absence of simple genetic markers for metabolic resistance means that far less is known about the distribution of the responsible alleles. Biochemical assays, and in some cases microarray studies, have implicated metabolic resistance In An gambiae s.l. in Kenya [22, 108], Cameroun [109, 110], Benin , Nigeria , Ghana , Mozambique , South Africa  and Zimbabwe . Over expression of CYP6P3 and/or CYP6M2 has been found in pyrethroid-resistant An gambiae populations from Benin, Nigeria and Ghana [23, 25], mainly in co-association with the kdr L1014F allele. This co-occurrence of resistance genes may constitute an additional threat to malaria vector control as epistasis between these two types of resistance conferred extremely high level of pyrethroid resistance in Culex quinquefasciatus ." Ranson 2011, Pg 12. For example, World Health Organization 2012 states, "There are multiple examples of insecticide resistance spreading quickly over large areas. For example, the kdr mutations known as 1014F and 1014S were first detected in West and East Africa, respectively (referred to as kdr West and kdr East mutations). 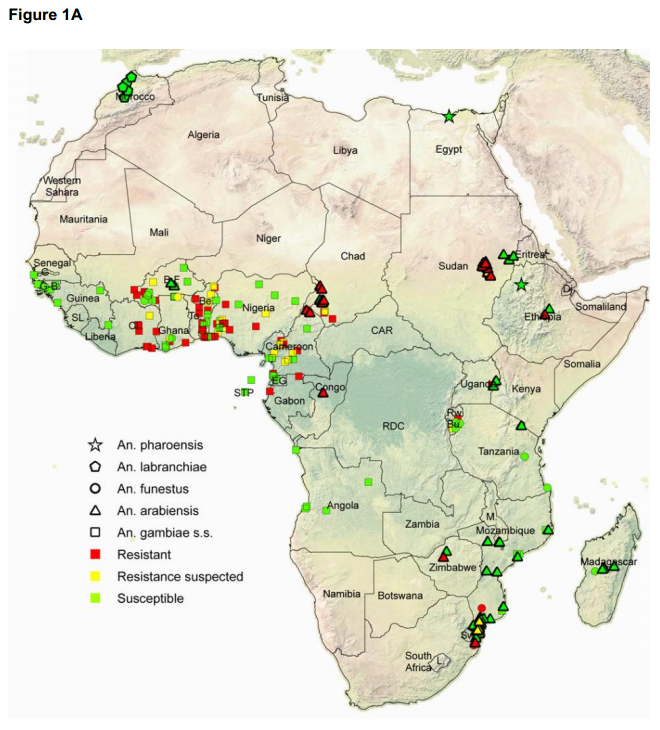 They have now been detected on both sides of the African continent because of both the spread of the original mutations and because of new, independent origins of the same mutations (Figure 14). kdr West has now been detected as far East as Ethiopia, Sudan, Uganda and Zambia, while kdr East has been found in Angola and several countries in West and Central Africa (such as Benin, Burkina Faso and Côte d’Ivoire) (24 )" (pg 38). It is ambiguous here whether "spreading quickly" refers to resistance or the detection of resistance.
" Data from experimental hut trials also suggest that resistance could contribute to a lower-than-expected level of control." World Health Organization 2012, Pg 14.
" Other smaller scale studies have assessed the impact of resistance on entomological parameters, using experimental huts, with very variable results. An early experimental hut trial of ITNs in Côte Ivoire showed no apparent difference in the effectiveness of ITNs between two adjacent sites with resistant and susceptible populations of An gambiae [125, 126]. By contrast, a comparative study of the efficacy of lambdacyhalothrin used for IRS or net treatment in Benin indicated a major loss of efficacy associated with pyrethroid resistance in An gambiae at Ladji, in southern Benin compared to Malanville in the north where the vectors remain largely susceptible to pyrethroids ." Ranson 2011, Pg 14. For more recent studies, see Van Bortel et al. 2009 and Dabiré et al. 2006. "One of the problems associated with many of these studies is that, due to the lack of molecular markers for alternative resistance mechanisms, the frequency of kdr alleles is frequently used as a proxy for resistance. This can be misleading if metabolic or other resistance mechanisms are the predominant resistance mechanism. There is an urgent need for properly controlled large-scale trials to assess the impact of pyrethroid resistance on IRS and ITNs. Such studies should use both entomological and epidemiological indices and should be conducted in areas where alternative resistance mechanisms are known to be responsible for pyrethroid resistance. Furthermore, these studies must consider the possibility of behavioural resistance and monitor for changes in key traits such as location of resting and feeding which may impact on the efficacy of current insecticide based interventions." Ranson 2011, Pg 14-15.
" The consensus is that resistance of operational importance will eventually emerge to any insecticide that continues to be widely used. Insecticide resistance genes have clearly been spreading and will spread further, particularly in the face of continuing selection pressure. While it is not known precisely how quickly insecticide resistance will spread if nothing is done, resistance genes are capable of spreading within a vector population very rapidly. There are numerous examples of this in both public health and agriculture." World Health Organization 2012, Pg 36.
" Enthusiasm for resistance management may also be hindered by the paucity of reliable data on the impact of resistance on current interventions, as discussed above, and this must clearly be a priority for further research. Nevertheless, the rapid increase in pyrethroid resistance and the increasing selection pressure from a wide range of sources … it is vital that policy makers and programme implementers recognise the growing threat posed by insecticide resistance and strive to integrate resistance management into all control programmes." Ranson 2011 Pgs 15-16. "Although there are limited options for [resistance management] with LLINs, they may retain an effect despite increased resistance to pyrethroids. Firstly, nets provide a physical barrier against biting by mosquitoes as long as they are intact ( 2). Secondly, in most vector species, resistance to pyrethroids does not completely reduce the effect of the insecticide. It has also been observed that the irritancy of pyrethroids (‘hyperexcitatory response’) may reduce mosquito blood-feeding or encourage diversion to other hosts by certain vector species that do not feed exclusively on human hosts. This effect can vary, however, by species and geographical location." World Health Organization 2012 Pg 45. Vectors are still killed because of multiple exposures to an insecticide in the field. Vectors may still be killed by an insecticide if they come into contact with it on many occasions within a short time (6). While a single standard dose of insecticide might not have the desired effect, multiple exposures in the field (for example landing on a sprayed surface three to four times) can lead to a higher accumulated dose of the insecticide, which may be sufficient to kill the vector. Similarly, vectors that are resistant may have a lower excito-repellent response when exposed to pyrethroids. Therefore, they may remain exposed to the insecticide for longer and receive a larger dose, and thus be killed anyway ( 3). Older vectors are more susceptible. Metabolic resistance is in some cases expressed more strongly in young mosquitoes, but, when they are older, susceptibility returns. Therefore, insecticides still kill older mosquitoes (7). Since it is these old mosquitoes that transmit malaria, the resistance may not cause an increase in transmission. Resistant vectors are less capable of transmitting malaria. It has been suggested that the ability of resistant vectors to transmit malaria might be reduced as, even if they are not killed by an insecticide within 24 hours, the insecticide might still inhibit their ability to live for the 12 days necessary to develop the malaria parasite. Alternatively, a vector's resistance to an insecticide might be offset by a lower level of infection, which is not as great a threat to the human population." World Health Organization 2012, Pg 111. "The development of malaria parasites into the infectious sporozoite stage takes 10 or more days following a blood-meal . The older cohort of An. gambiae s.s. used in this study (17-19 days old) could potentially harbour infectious parasites but would be more susceptible to insecticide-based control. Targeting older, and arguably more epidemiologically significant mosquitoes, has been proposed as an alternative strategy for wider malaria control in which the selection on resistance to the control agent is reduced." Jones et al. 2012. World Health Organization 2012, Pg 36. "Resistance can probably be reversed only if the vector incurs a ‘fitness cost’ for being resistant (if the resistance gene confers some disadvantage on these vectors in comparison with susceptible populations). Once the insecticide is changed, these resistant mosquitoes will no longer have an advantage, and will die out. "Some IRM strategies (e.g. rotations) are based on this concept — that removing selection pressure will reverse resistance, and that it may therefore be possible at some point to reintroduce the original insecticide into vector control programmes." World Health Organization 2012, Pg 14. "Vector control is very dependant on a single class of insecticides, the pyrethroids. These insecticides are safe and fast acting and are the only class approved for use on insecticide treated materials." Ranson 2011, Pg 1. See World Health Organization 2012, Table 5 on Pgs 83-84. "Alternative insecticide classes (e.g. pyrroles, oxadiazines) used to control agricultural pests have recently proven effective in laboratory and field trials against pyrethroid-resistant mosquitoes but unfortunately these are not currently available in suitable formulations and some of them may never be mass-produced for malaria control [132-134]. Initial results from studies combining unrelated insecticides on mosquito nets [126, 135, 136] or insecticide with synergists or repellents [137-139] to delay the appearance of resistance or further prevent its development are encouraging. At larger scale, a randomized controlled trial carried out in an area with insecticide resistance in southern Benin (REFS-MAE initiative), showed a significant reduction of transmission and malaria incidence in children <5 by combining spatially different interventions in the household (e.g. ITN plus carbamate treated plastic sheeting) compared to the control group (i.e. selective coverage of ITN to populations at risk) . Nevertheless, more work is needed on the durability of these approaches and their acceptability by populations before the additional cost can be justified to control programme managers." Ranson 2011, Pg 16.